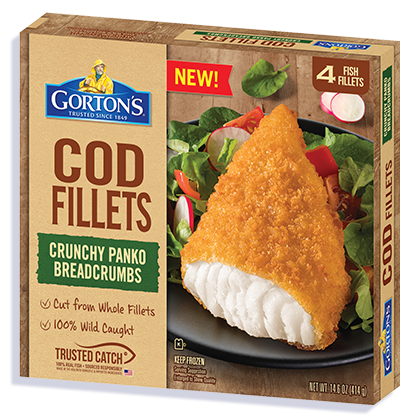 Wild-caught Cod fillets coated in crunchy panko breadcrumbs. Some people might call our crunchy, panko-crusted Cod a tasty alternative to the traditional fish fry. But with whole, wild-caught fillets and no artificial ingredients, it might become your go-to choice. Remove fillets from packaging before cooking. 3. Bake 22-24* minutes total, flip after 12 minutes.